Home Physical Characteristics How Big is a Praying Mantis? 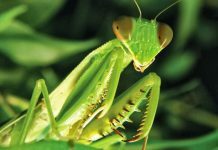 Most praying mantis are no more than 5 inches in length. 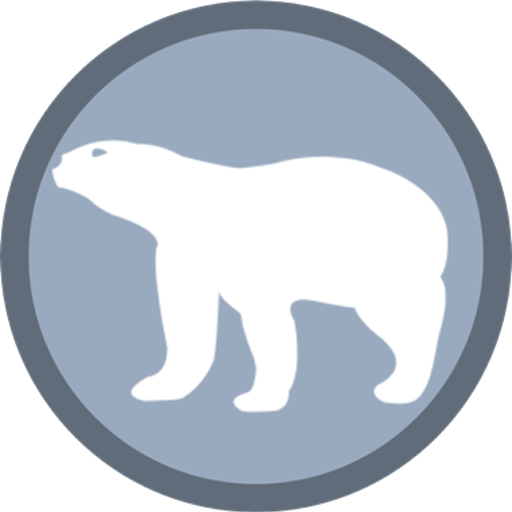 The smaller species measure around 2 to 3 inches while the bigger specimens reach the overall length of 6 to 7 inches. Chinese mantis (Tenodera sinensis) are some of the largest mantids with the length of more than 6 inches. It is the biggest mantid in North America. Carolina mantis on the other hand can grow only 2 inches in length. Praying mantis are slightly bigger than an adult grasshopper. However the bigger species such as Chinese mantis are pretty long with the length averaging at 11 cm (4.3 inches). 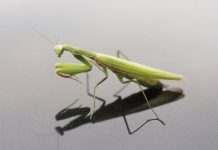 However the species may be the female mantis is always bigger than the male. The female is almost two inches greater than its mating partner. The only bird that is about the size of an adult praying mantis is hummingbird—the world’s smallest bird. 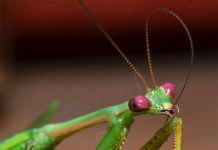 That is why mantis occasionally attack and kill hummingbirds. Hummingbirds are 2 to 3 inches in length. 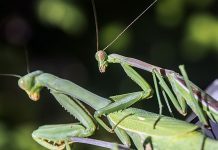 The biggest praying mantis ever recorded at 18 cm (7.08 inches) although scientists do believe that there may be 10-inch-long mantis out there in the wild. Grasshoppers measure only 2 to 3 inches in length thus they often fall prey to mantids. Adult mantis especially the bigger individuals can easily get hold of a bug or an insect which is about the size of a grasshopper. Mantids have got raptorial forelegs that turn out to be quite effective in taking down larger prey.